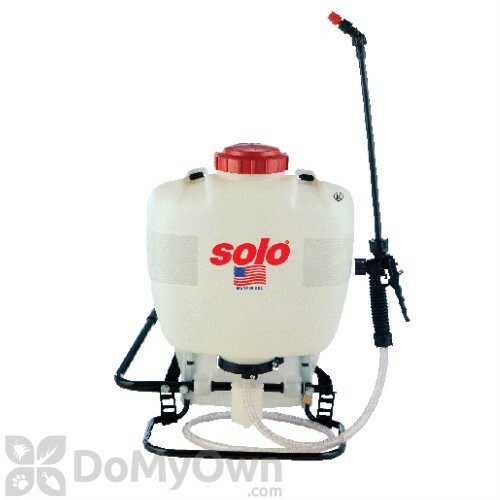 Solo 425 4-Gallon Professional Piston Backpack Sprayer is a high-quality backpack sprayer that is designed to make application of fertilizers, disinfectants, pesticides, herbicides and other formulation much easier. Its 4-gallon tank is constructed of high-density polyethylene with ultra-violet inhibitors to ensure durability and UV protection. It features a shut off valve, 4-feet high-pressured hose and a 28-inch wand to let you reach those hard-to-treat areas easily. It also comes with chemical-resistant Viton seals to ensure key areas will be secured and padded shoulder traps to allow you to carry your sprayers comfortably. It is also capable of producing wide pressure range for up to 90 psi with the help of its rod-activated piston pump, making it virtually possible to perform every spraying task efficiently. Its 4.25 in. opening allows you to clean and fill it easily. Is the Solo 425 4-Gallon Professional Piston Backpack Sprayer battery-powered? No, the Solo 425 4 Gallon Professional Backpack Sprayer is a pump sprayer. If you are looking for a battery-powered sprayer, you may want to consider the Solo 416 Battery Backpack Sprayer. Will this Solo 425 hold up against bleach? It would not be recommended to use bleach in the Solo 425 4-Gallon Professional Piston Backpack Sprayer. Instead you could use the Chapin Euro Bleach Backpack Sprayer 4 Gal. (61575) or Chapin Industrial Poly Bleach Sprayer 1 Gal. (20075) designed to hold up against this harsh chemical.